Pour water into a small saucepan; bring to a boil. Add cocoa and instant espresso; stir until smooth. Remove pan from heat and add both types of chocolate, stirring until smooth. Add bourbon and vanilla and stir to combine. Pour mixture into a large bowl and set aside. In a medium saucepan, whisk together eggs, egg whites, sugar and salt; place over a large saucepan filled with 2 inches simmering water (do not let medium saucepan touch the water). Whisk egg mixture constantly over double boiler until slightly warm (about 115°F). Remove saucepan from heat and pour egg mixture into the bowl of a stand mixer. Beat egg mixture on high until soft peaks just begin to form, about 7 minutes. Stir a third of the egg mixture into the chocolate mixture. Carefully fold in remaining egg mixture, then fold in whipped topping. Coat an 8-inch springform pan with cooking spray and cocoa powder. Pour batter into prepared pan. Bake for 25-30 minutes or until just set. Remove from oven and cool completely on a cooling rack. Cover cooled cake with plastic wrap and place in refrigerator for 8 hours (or overnight). Make the whipped cream: In a blender or food processor, blend frozen raspberries until a puree forms. Pour raspberries into a bowl and stir in sugar. Set aside. Pour heavy whipping cream into the bowl of a stand mixer; whip on high speed until stiff peaks form. Fold in raspberry mixture. Remove cake from springform pan and place on a serving dish. Top with whipped cream. Garnish with fresh raspberries, if desired. Hear ye, hear ye! Gather ‘round to heareth a tale of The Best Gluten-Free Chocolate Cake That Ever Was. I know a lot of GF desserts can be super boring, super weird-looking or super gross, but this cake? This fudgy, flourless wonder? It’s only super rich, super decadent and super tasty. And with a topping of delicious homemade raspberry whipped cream, there’s no excuse not to make this cake for your friends and family—gluten and gluten-free eaters alike. Let the cake making begin! First, prepare your ingredients. It’s best to use high-quality chocolate for this recipe, like Guittard or Ghirardelli, as the flavor of the chocolate really stands out in the final product. It’s worth the extra Benjamins! Whip up the chocolate mixture – which includes chocolate (duh), instant espresso, bourbon and vanilla. AKA pretty much all that is good and tasty in this world. Once you’ve made the egg mixture, stir some of it into the chocolate, then fold in the rest. Add some whipped topping, too, for EXTRA DELICIOUSNESS. Pour the batter into a greased and cocoa powdered springform pan, then bake it up until it’s just set (the center will continue to bake as it cools). Will you just Look. At. That? That’s pure magic, right there. Now comes the hardest part: You’ve got to cover the cooled cake and let it set in the fridge overnight. Oh, the agony! 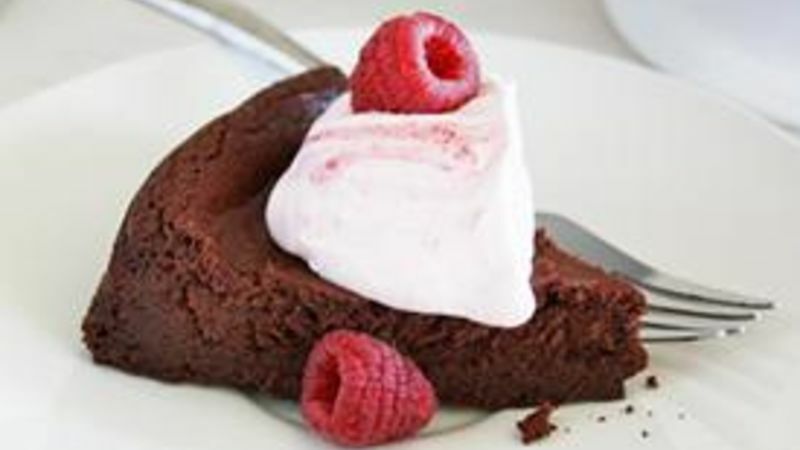 The next day, whip up some raspberry whipped cream with raspberry puree, sugar and heavy whipping cream. It’s sweet and tart and creamy and whippy and all sorts of tasty. FINALLY, we can dig in! This is so much yumminess in one cake I can’t even deal. Someone hand me another slice to calm me down. Stephanie (aka Girl Versus Dough) has a fever, and the only prescription is more fudge cake. Check out Stephanie’s Tablespoon member profile and keep checking back for her own personal recipes on Tablespoon!